Function to evaluate analytical model functions on a grid. So far the function can only deal with pixel coordinates. model : FittableModel or callable. Analytic model function to be discretized. Callables, which are not an instances of FittableModel are passed to custom_model and then evaluated. x range in which the model is evaluated. The difference between the upper an lower limit must be a whole number, so that the output array size is well defined. y range in which the model is evaluated. The difference between the upper an lower limit must be a whole number, so that the output array size is well defined. Necessary only for 2D models. 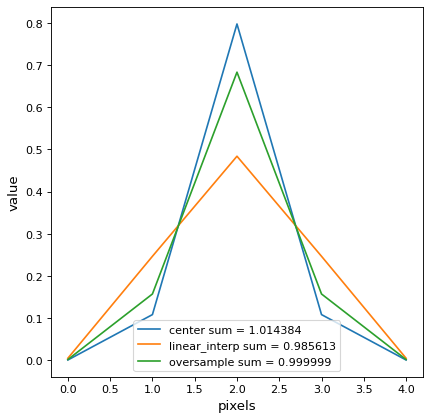 Discretize model by linearly interpolating between the values at the corners of the bin. For 2D models interpolation is bilinear. Discretize model by integrating the model over the bin using scipy.integrate.quad. Very slow. Factor of oversampling. Default = 10.